The Cheese World Cup was arranged in Bergen this year, and the Norwegian cheese Fanaost from Ostegården was named the best cheese in the world! To celebrate our great cheese country, Tine decided to put together a cheese box called Proffenes Osteskrin. For a limited time period only, Tine has made it possible for regular consumers to experience the secret cheeses that, until recently, only chefs and certain specialty stores have had access to. For those of you who remember, I paid a visit to Tine’s cheese bank – Ostebanken – earlier this year. 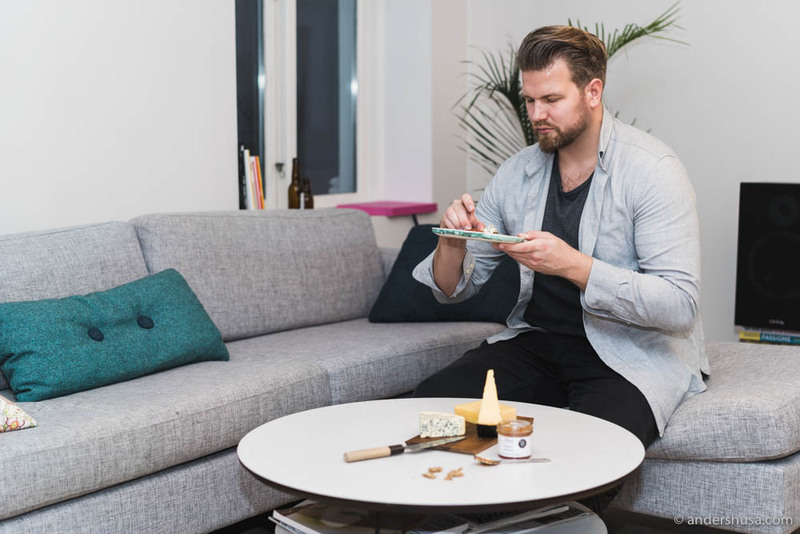 There, they age famous Norwegian cheeses like Norvegia® and Jarlsberg® for three to eight years. Yesterday, Tine sent me a box of some of these cheeses to try. 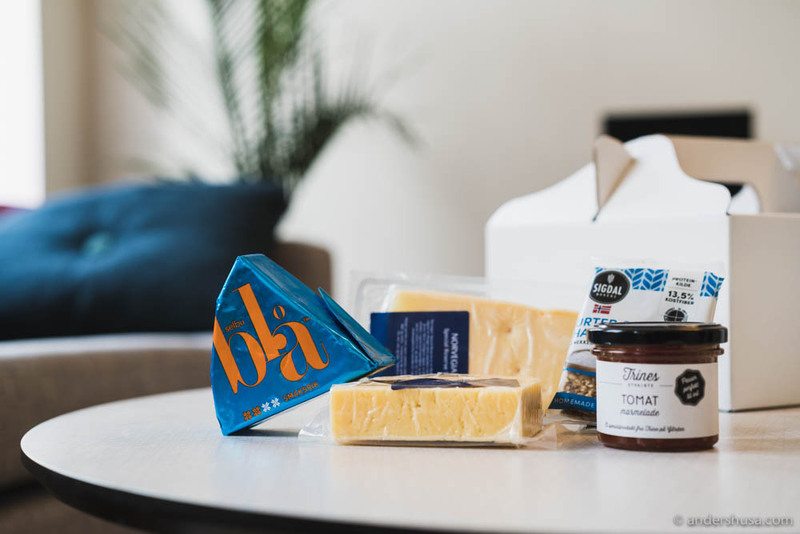 The box contained aged Østavind®, Norvegia® Special Reserve (stored for 5 to 8 years), and the blue cheese Selbu Blå®, which comes with sweet tomato jam and crunchy crispbread. Luckily you can get a taste of them too! 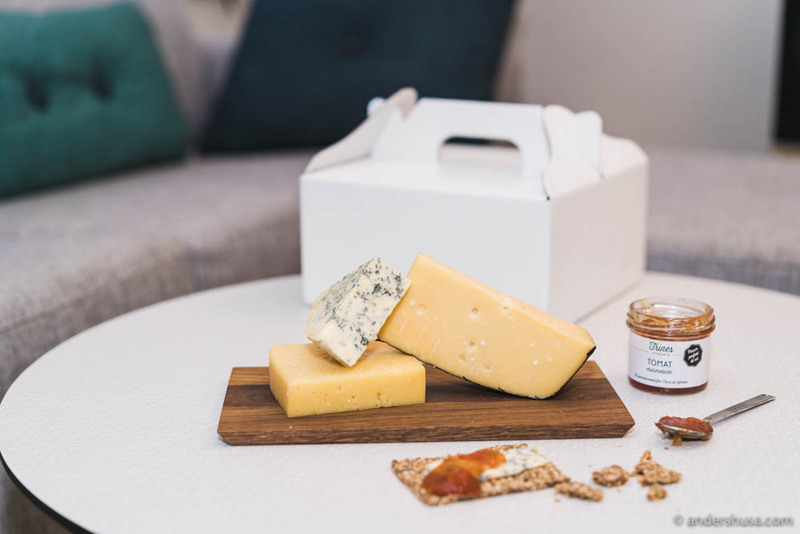 For the first time in history, you can buy Tine’s cheese online and get them delivered to your door. This project is actually a beta test limited to only 1500 cheese boxes. Each box is delivered directly to your mailbox or door the following Friday or Saturday after ordering. The last booking deadline is at 19:45 the day before delivery. Packages are delivered to private addresses, but not business addresses at the time being, within Oslo, Akershus, Buskerud, Hedmark, Telemark, Østfold, and Vestfold. Get yours here! When cheese matures, both the taste and texture changes. As the cheese dries, it becomes harder and often forms a crust. Meanwhile, the flavor is concentrated, which makes mature cheeses taste stronger, more developed and complex. Proteins are broken down into amino acids, which crystallize and forms areas of crunchy white spots that feel a bit like sea salt when your teeth bite into the cheese. Aged hard cheeses with these features are my absolute favorite. 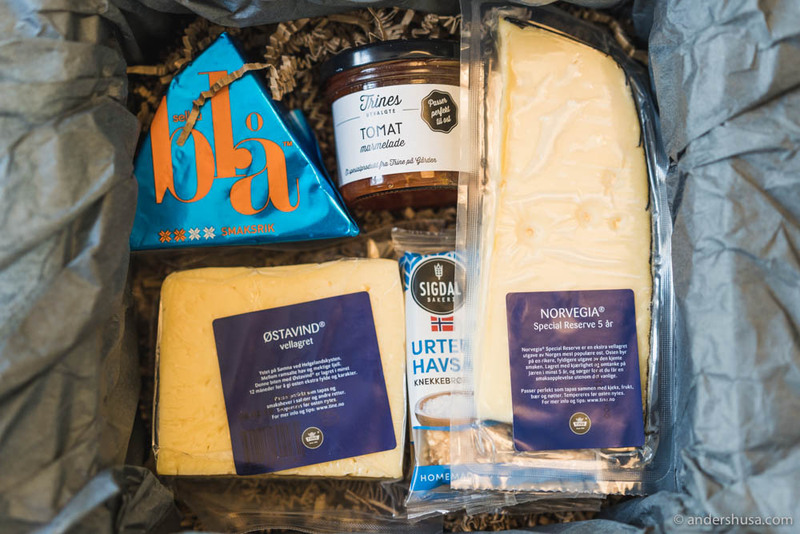 Norvegia® Special Reserve is an aged version of Norway’s most sold cheese. Who didn’t have Norvegia® in their fridge when they grew up? Stored for at least five years (but up to eight) it is quite different from its mild, younger brother. Salty, creamy, crunchy and delicious, the cheese was awarded bronze in the Cheese World Cup in 2017. This is the Norvegia® for special occasions, although I can imagine it tastes great on a sandwich as well. Østavind® is a fairly new cheese from Tine, made from fresh milk from Northern Norway. The cheese has small holes and a porous texture, with a sweeter and more complex flavor than Norvegia®. I’ve tasted the regular grocery store version and this one is so different! After just 12 months of storing, Østavind® has a much richer, even sweeter flavor, and the consistency is smoother and more firm. Protein crystals have started to form already, which is rare in such a young cheese. Selbu Blå®, as the name suggests, is made in Selbu in Sør-Trøndelag. A high-quality blue cheese that has been developed especially for Norwegian palates. With an aromatic and rich flavor, but still mild and round, combined with a creamy texture, it is very versatile for cooking. 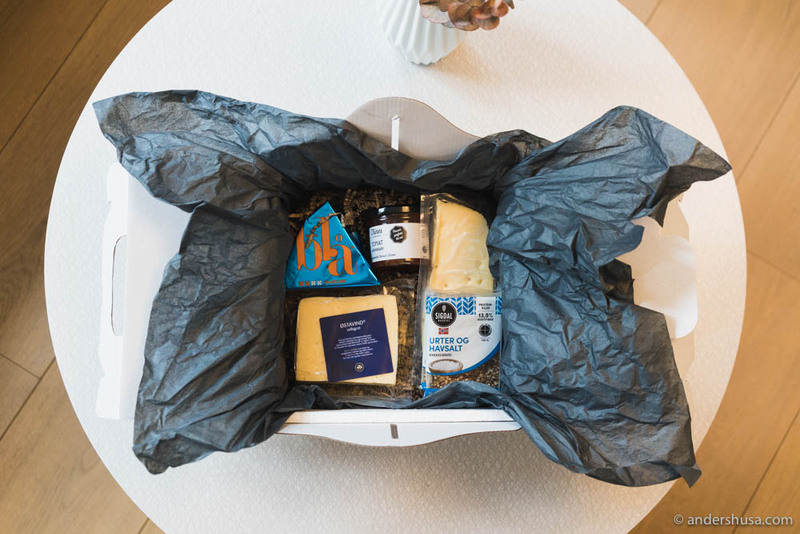 In the cheese box, you get a tomato marmalade from Trine på Gården and crunchy crispbreads with herbs and sea salt from Sigal, which goes great together with the blue cheese. As a bonus, the tomato jam is made from leftover tomatoes that would otherwise have been wasted, thus, contributing to more sustainable farming. Did you purchase the cheese box? Leave a comment and let me know. Looks like a delicious box. Perfect gift for the holidays!